Taylor's Sweet Little Art and Nerd Site: Pin-Up of the Day- Boushh! Sitting in the theater back in 1983 is me as a kid looking at Boushh and saying, "Cool". Why? Because this character's armor is fantastic! I was completely shocked when I discovered that it was actually Leia in the costume. Sorry for the spoiler alert people, but by now you should have seen this movie. 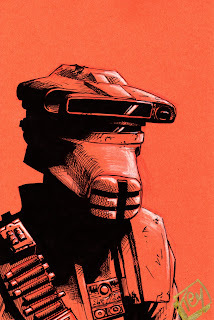 Boushh's design is another reason why I love Jabba's Return of the Jedi chapters. There is a huge variety of creatures and tech to be seen, and all of it rather different from one another. Years later when I read Shadows of the Empire (which, if you have not read this, and you are a Star Wars fan, get to it! It's great!) Boushh is mentioned a couple of times, including a mention to his demise. Princess Leia ends up with the armor which she uses a couple of times before she is discovered in it in Jabba's palace. If you want to read up on ole' Boushh, Wookiepedia has an article on him. Now back in the day in 1983, Kenner had put out a Boushh action figure. I never found one. If I did, I'd probably still have it today; or maybe not. I am on the look out for one complete now, and if Hasbro decides to put out a vintage collection version of Leia in this suit, I might be forced (by myself) to get one. You can also see this art piece here.